Kevin Durant and Russell Westbrook made amends with a nice alley-oop during the All-Star Game, but now it’s back to business as the Golden State Warriors are chasing history once again. The team has the best record in the NBA for the third consecutive season and it looks like the addition of KD has gone as smoothly as possible. Now it’s time to look ahead to the playoff push, as Nike Basketball has unveiled the Nike KD 9 Elite for the postseason. Durant has already unveiled this pair in-game in an all-black colorway, but for those curious as to the construction of the upcoming model, this Wolf Grey/Bright Crimson option should do the trick. 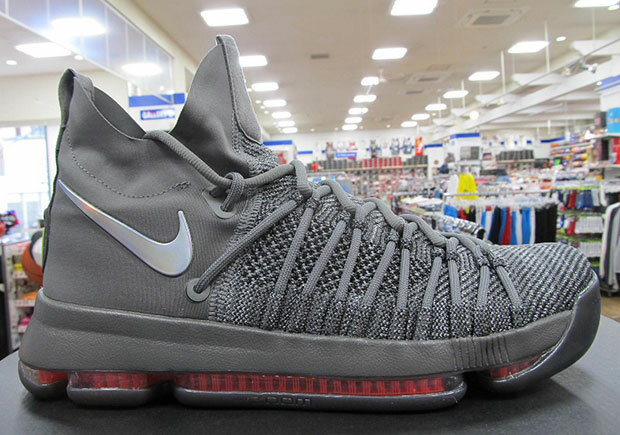 The updated KD 9 features a woven Flyknit construction, a head-turning lacing system where the laces double as a sort of Dynamic Flywire lockdown system, and a slip-on upper that features a lightweight textile that stretches with the foot for a comfortable ride. Don’t worry, that full-length Zoom Air cushioning system remains and an iridescent metallic Swoosh similar to that found on the debut PG 1 hits the KD 9 Elite in its first retail release. This option is debuting in Asian territories this Thursday, February 23rd. What do you think of KD’s latest Elite model? Check out a better view below and stay tuned for a stateside release in the near future, as we’ll update you on a Release Date right here on Sneaker News.